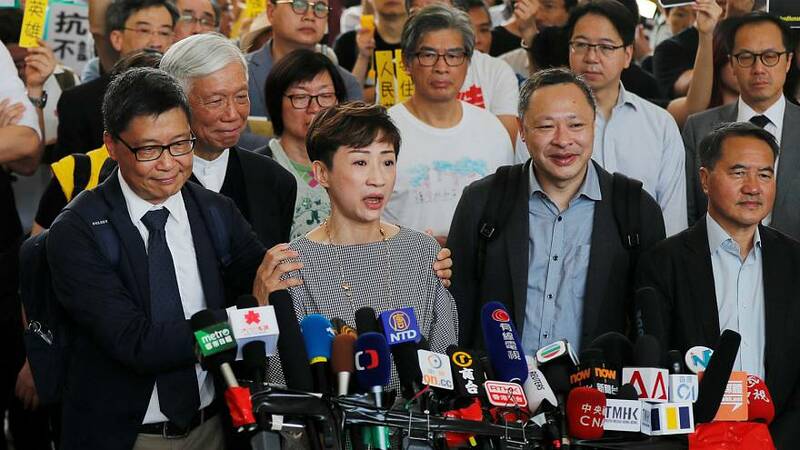 HONG KONG (Reuters) - A Hong Kong court found leaders of the 2014 "Occupy" civil disobedience movement guilty on Tuesday of public nuisance charges during the mass protests, in a landmark verdict that comes as the China-ruled city's freedoms come under strain. Three of the defendants accused of playing a leading role in planning and mobilising supporters during the 79-day street occupations in 2014 - Benny Tai, Chan Kin-man, and retired pastor Chu Yiu-ming - were found guilty of conspiracy to commit public nuisance. "The reason that we committed civil disobedience is because we want justice for Hong Kong people." In a summary of his judgement, Justice Johnny Chan noted that while the concept of civil disobedience is "recognised in Hong Kong", it wasn't a defence to a criminal charge. "The offence of conspiracy to cause a public nuisance does not have the undesirable effect of curtailing or suppressing civil disobedience at its formation stage or suppressing human rights as the defendants contended," the summary read. Since the city returned from British to Chinese rule in 1997, critics say China has reneged on its commitment to maintain Hong Kong's high degree of autonomy and freedoms under a co-called "one country, two systems" arrangement. In the more than four years since the Occupy protests, democracy activists, diplomats and business leaders have expressed grave concerns over what they say is Beijing's tightening grip on the city's freedoms.